Description: Wow time flies! It's March!?!?! Here are the nominees for our February Drone Video of the Month. The winner will be announced Tuesday, March 12th. After spending a year traveling around four continents (he noted that only 3 are shown here) anthonytori shares this fantastic travel reel titled Traveling Across Three Continents Drone Reel. He also says "It might not be as obvious, but there is a mini story/message in the video." So, watch closely! 2 0 1 8 - don't fear the unknown is an inspiring film narrated by creator Jaxon_roberts. You'll get an inside look of his travel experiences and as he stated, the "biggest year of my life so far." 2nd Annual Drone Video Awards winner chrisxgxc will amaze you once again with Heads Up, an entertaining short film that will make you laugh. And don't worry, Chris says "No person or drone was harmed in the making of this film." DJI Time Story is full of beauty and dronies! druno says "I would like to tell you about my most beautiful shots made with the dji drones." Nicely done druno, nicely done! He's back! In this 2018 Aerial Reel, ericpeniata shows us a little bit of everything. Filled with country, city and ocean views, you won't want to look away from all the beauty! Be amazed by Undiscovered Kazakhstan! Uploaded by AirVuz newcomer kuznetsovkz, this film is full of mountain, river valleys and glacial lake views. We can't wait for more! Wow what an adventure A dream night at 3200 meters! must have been! This dream night is the result of Ultraprod making what we call a spontaneous decision to climb the Oldenhorn so he could camp out on top! The cold weather and winds didn't stop him and "were worth it because the sunrise was just incredible!" Truly beautiful and what an experience! Featuring many beautiful icebergs, Ice Ballet - Ilulissat, Greenland - 4K is stunning! inva+sla show off their brilliant filming, editing and colouring skills. It truly is an ice ballet! Morrisey Video Production is back with My favorite Aerials of Oregon 2018! This collection of favorites shots feature bridges, forests, ocean tides, mountains, fall leaves and more! East Greenland Onboard Arktika 4k is another breathtaking film from 2nd Annual Drone Video Awards winner Brendon Dixon. Brendon captures all this beauty while on an adventure onboard Arktika as it sails from Iceland to the East Fjords of Greenland. Remarkable! 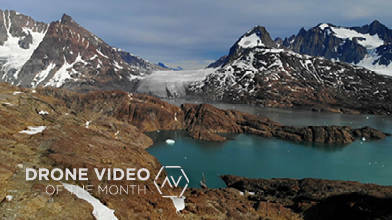 See all ten Drone Video of the Month, February nominees HERE!